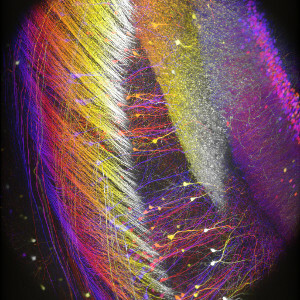 免疫蛍光の試料ご提供:Lynne Holtzclaw of the NICHD Microscopy and Imaging Core Facility, a part of the National Institutes of Health (NIH) in Bethesda, MD. 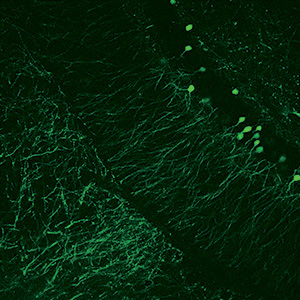 Scientists investigate the structure of the brain to understand functions of neuronal proteins as well as the causes of neurological diseases. 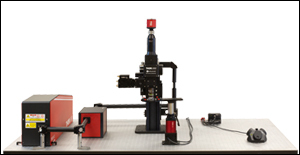 Due to the difficulty of imaging through brain tissue caused by light scattering, this study often requires a multi-modality configuration allowing for a range of experimental conditions using any combination of multiphoton, confocal, and epi-fluorescence imaging. 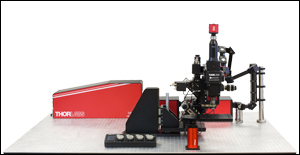 The three example multiphoton microscope configurations in the table below are designed to accommodate the needs of Structural Biology. 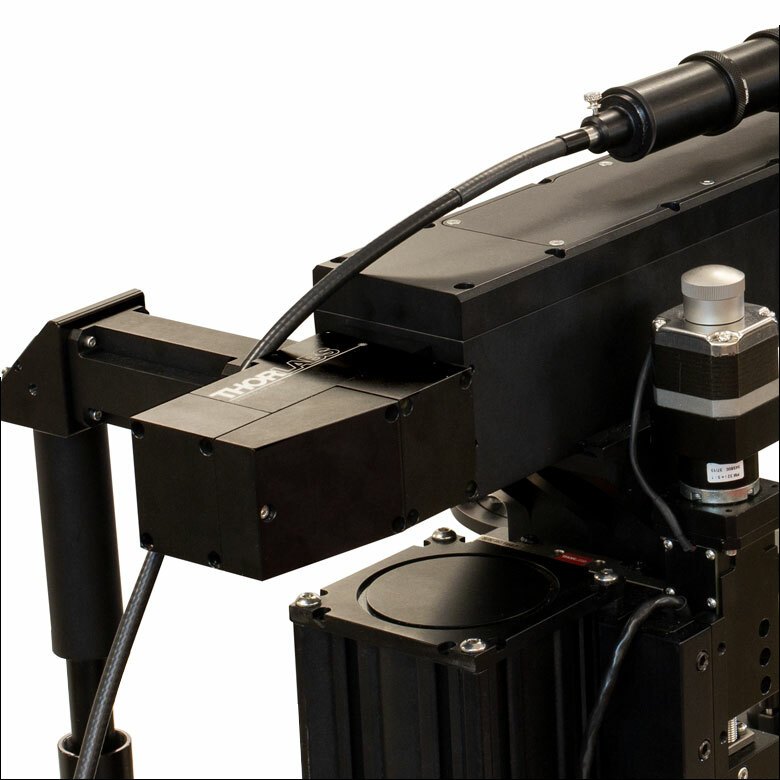 Each configuration features fast-Z power ramping to accomplish high-resolution imaging deep within a sample. Our Two- and Three-Photon Imaging configuration uses both galvo-resonant and galvo-galvo scanners and infrared wavelength scanning optics to image second- and third-harmonic generation (SHG and THG). 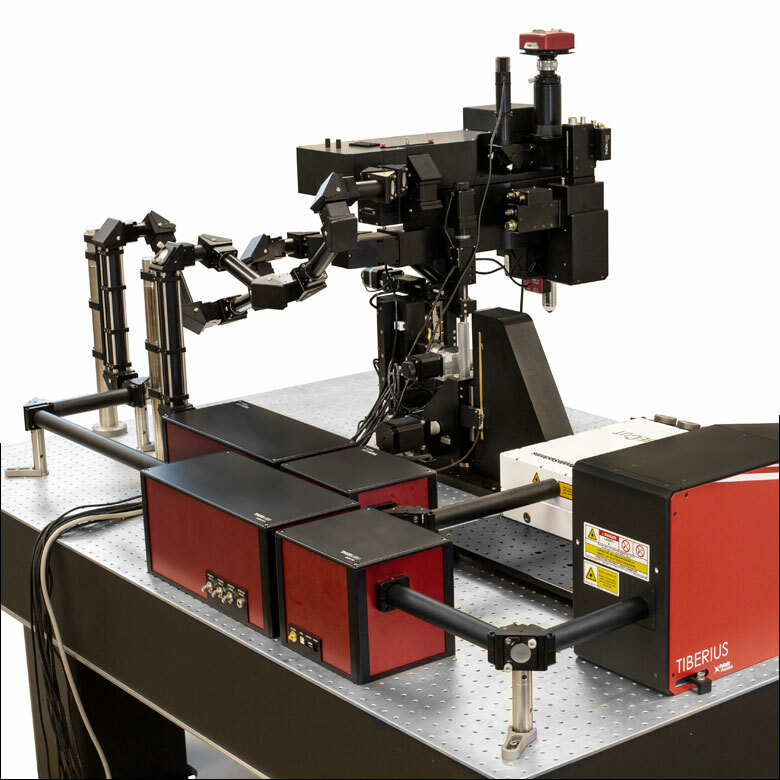 Alternatively, our Dual-Path Multiphoton Microscope with Confocal Imaging is outfitted with a confocal path that accommodates up to 4 laser lines and a 4-channel PMT detection module. 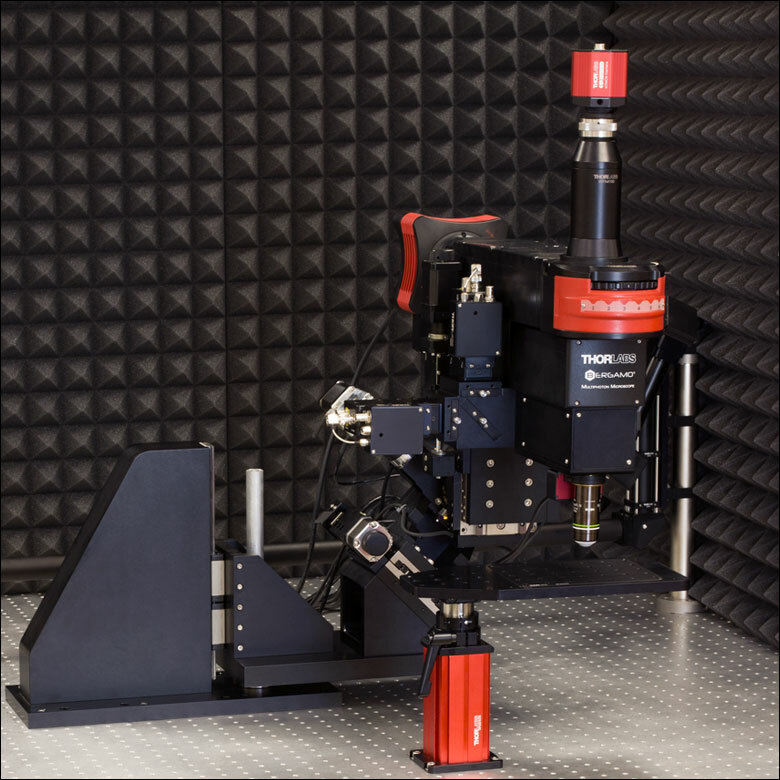 The addition of a six-cube epi-illuminator module and sCMOS Quanatlux camera allows this system to perform epi-fluorescence imaging. 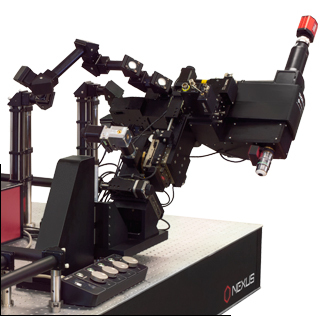 Our Simple XYZ Imaging configuration is well-balanced for both in vitro and fixed stage in vivo microscopy research. With a removable transmitted illumination module, this versatile system can support a wide variety of experimental techniques, imaging modalities, and sample subjects. Lee KS, Huang X, and Fitzpatrick D. "Topology of ON and OFF inputs in visual cortex enables an invariant columnar architecture." Nature. 2016 May 5; 533: 90-94. Lang X and Lyubovitsky JG. "Structural dependency of collagen fibers on ion types revealed by in situ second harmonic generation (SHG) imaging Ion channels and G coupled receptors." Analytical Methods. 2014 Nov 13; 7 (5): 1637-2230. Ehmke T, Nitzsche TH, Knebl A, and Heisterkamp A. "Molecular orientation sensitive second harmonic microscopy by radially and azimuthally polarized light." 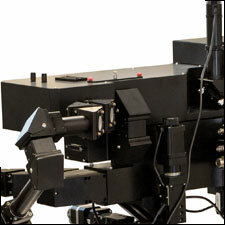 Biomedical Optics Express. 2014 Jul 1; 5 (7): 2231-2246. Lang X, Spousta M, Hwang YJ, and Lyubovitsky JG. "Noninvasive imaging of embryonic stem cell cultures by multiphoton microscopy reveals the significance of collagen hydrogel preparation parameters." Analytical Methods. 2011 Jan 20; 3 (3): 529-536. Cai F, Yu J, Qian J, Wang Y, Chen Z, Huang J, Ye Z, and He S. "Use of tunable second-harmonic signal from KNbO3 nanoneedles to find optimal wavelength for deep-tissue imaging." 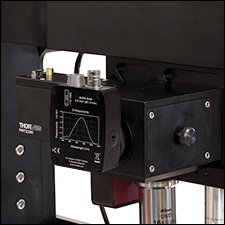 Laser & Photonics Review. 2014 Jun 17; 8 (6): 865-874. Poguzhelskaya E, Artamonov D, Bolshakova A, Vlasova O, and Bezprozvanny I. "Simplified method to perform CLARITY imaging." Molecular Neurodegeneration. 2014 May 26; 9 (19). 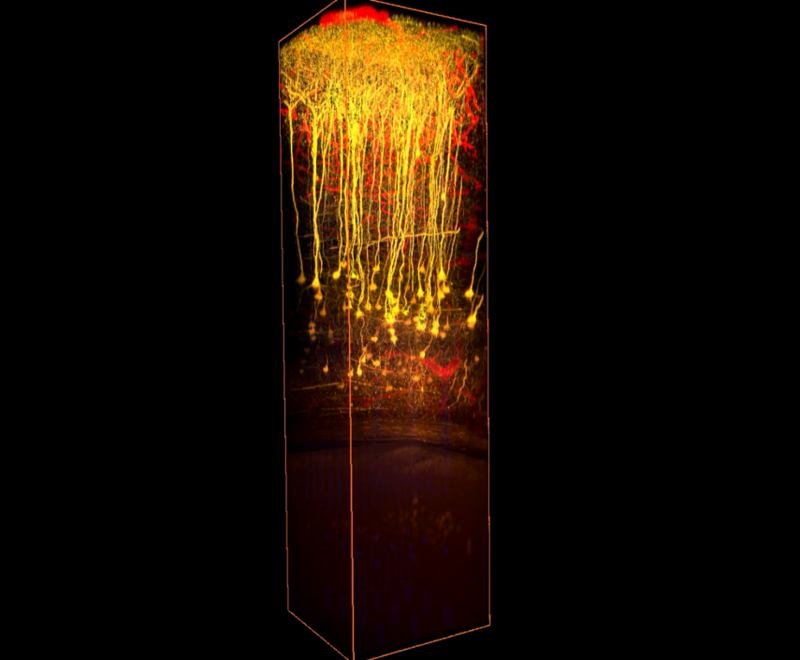 Researching neurological disorders involves measuring neural function using two-photon calcium imaging. 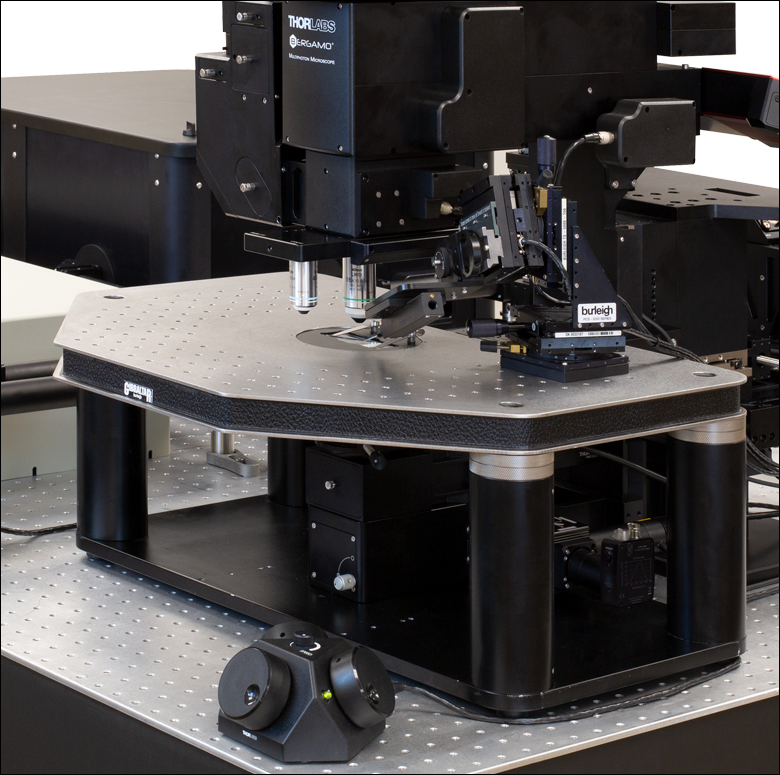 This research requires fast image acquisition and photostimulation. 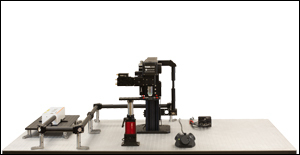 We recommend three of our multiphoton microscope configurations for this application (see the table below). 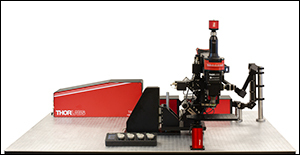 Each configuration offers a large working space and rotating microscope body, making it ideal for in vivo animal studies. 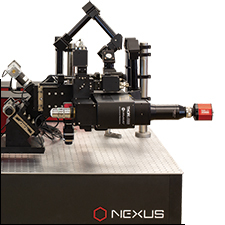 Our Multi-Target Photoactivation configuration features a spatial light modulator (SLM), which allows the activation of groups of neurons at varying depths within a single field of view. 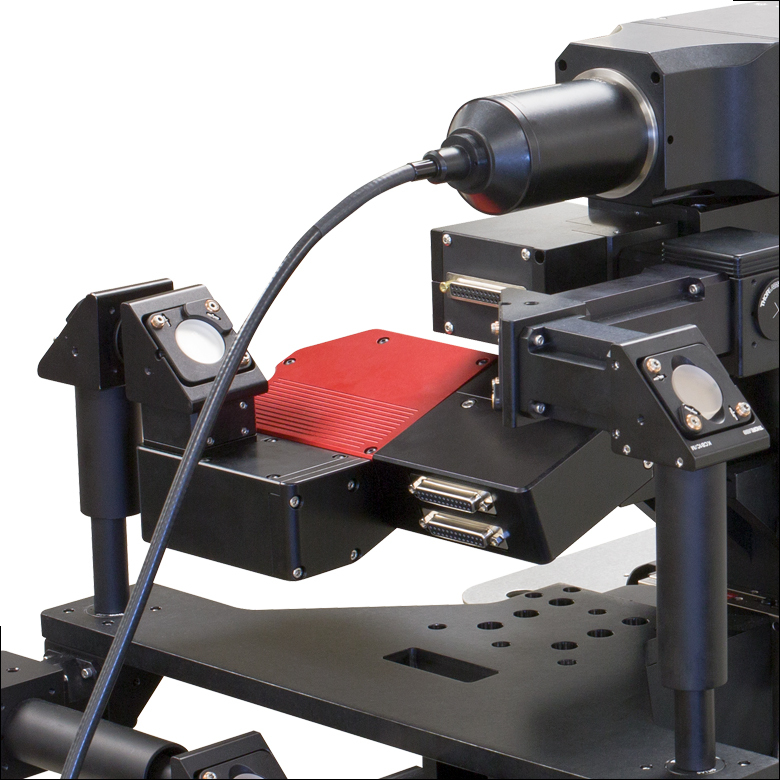 For increased penetration of samples with scattering tissues, the three-photon capability of our Two- and Three-Photon Imaging configuration is recommended. Our Random-Access Scanning configuration uses a resonant-galvo-galvo scanner to take multiple high-resolution images within a single field of view. 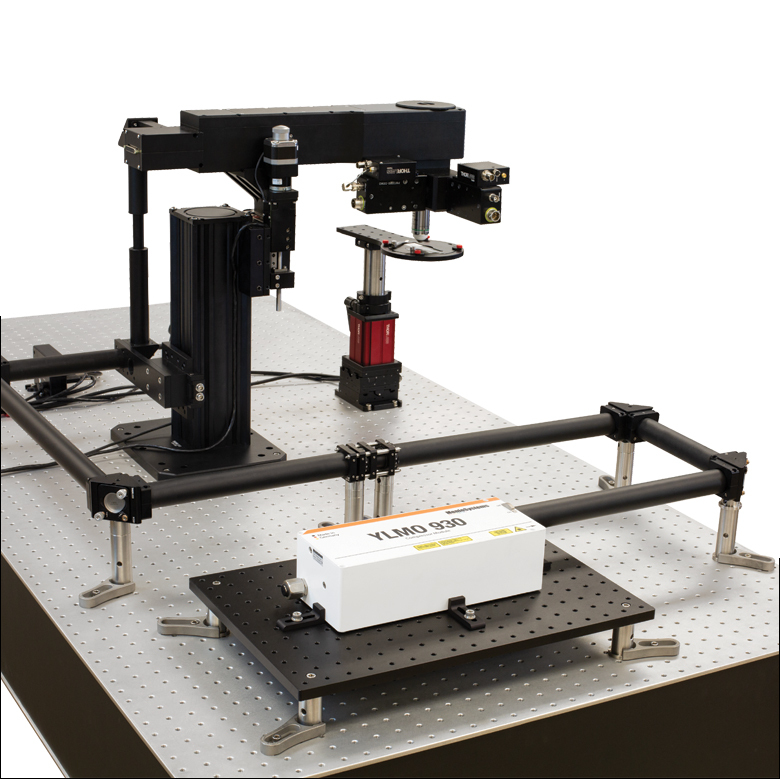 This scanner provides all the speed of a resonant-galvo scanner, while enabling multiple user-defined fluorescence activation regions for correlating neural responses in multiple regions of the brain. Murphy SC, Palmer LM, Nyffeler T, Müri RM, and Larkum ME. "Transcranial magnetic stimulation (TMS) inhibits cortical dendrites." eLife. 2016 Mar 18; 5: e13598. 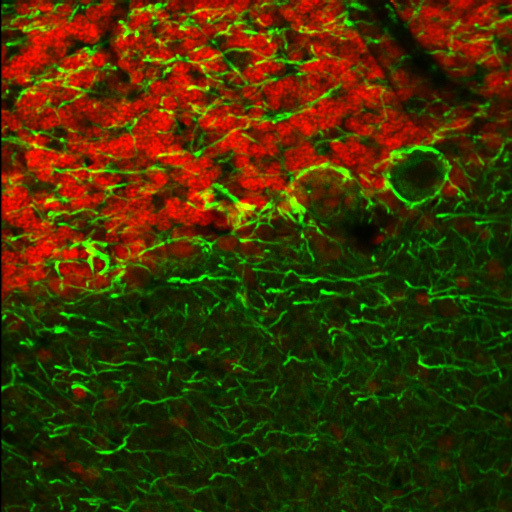 Lalchandani RR, van der Goes MS, Partridge JG, and Vicini S. "Dopamine D2 receptors regulate collateral inhibition between striatal medium spiny neurons." The Journal of Neuroscience. 2013 Aug 28; 33 (35): 14075-14086. 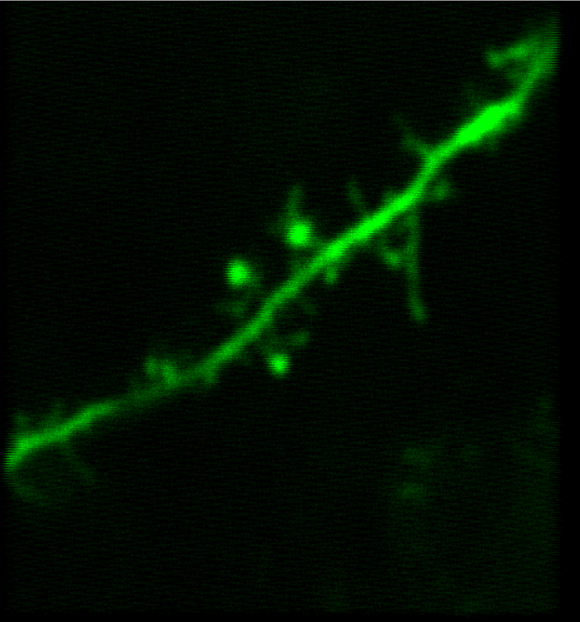 Scientists interested in this application focus on tracing neuronal pathways and researching dendritic spine plasticity. 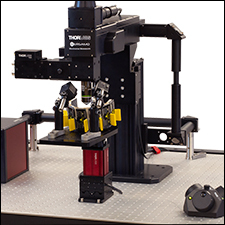 Imaging systems used in this type of research are capable of two-photon calcium imaging and/or confocal fluorescence imaging. High-resolution and high-sensitivity are crucial features for these systems. 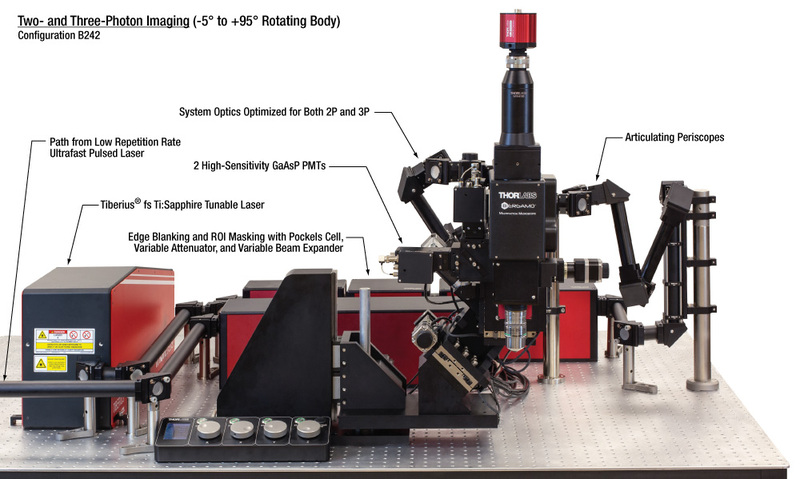 We offer three multiphoton configurations that are ideal for this application (see the table below). Each configuration may be used in photon-limited environments as they feature sensitive detection modules, in addition to our 10° or 14° full field-of-view collection optics with ultrasensitive GaAsP PMTs. Our Dual-Path with Confocal Imaging configuration allows for a range of experimental conditions to be observed using any combination of multiphoton, confocal, and epi-fluorescence imaging, along with photoactivation. Alternatively, the Video and High-Speed Imaging and Simple Z-Axis Imaging configurations provide a small footprint and large throat depth for in vivo two-photon imaging. Gillet SN, Kato HK, Justen MA, Lai M, and Isaacson JS. "Fear learning regulates cortical sensory representations by suppressing habituation." Frontiers in Neural Circuits. 2018 Jan 10; 11: 112. Micu I, Brideau C, Lu L, and Stys PK. 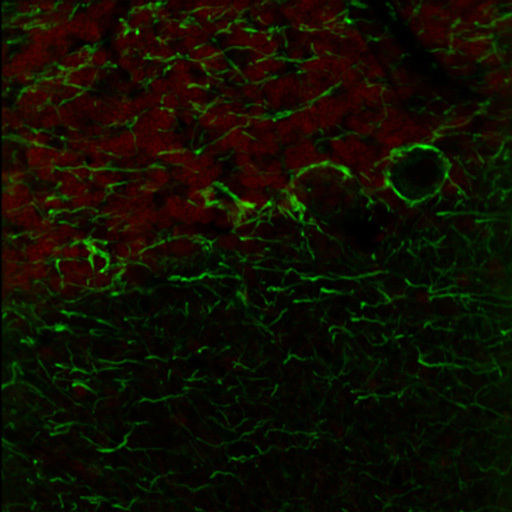 "Effects of laser polarization on responses of the fluorescent Ca2+ indicator X-Rhod-1 in neurons and myelin." Neurophotonics. 2017 Jun 5; 4 (2): 025002. Chen SX, Kim AN, Peters AJ, and Komiyama T. "Subtype-specific plasticity of inhibitory circuits in motor cortex during motor learning." Nature Neuroscience. 2015 Jun 22; 18: 1109-1115. Peters AJ, Chen SX, and Komiyama T. "Emergence of reproducible spatiotemporal activity during motor learning." Nature. 2014 Jun 12; 510: 263-267. 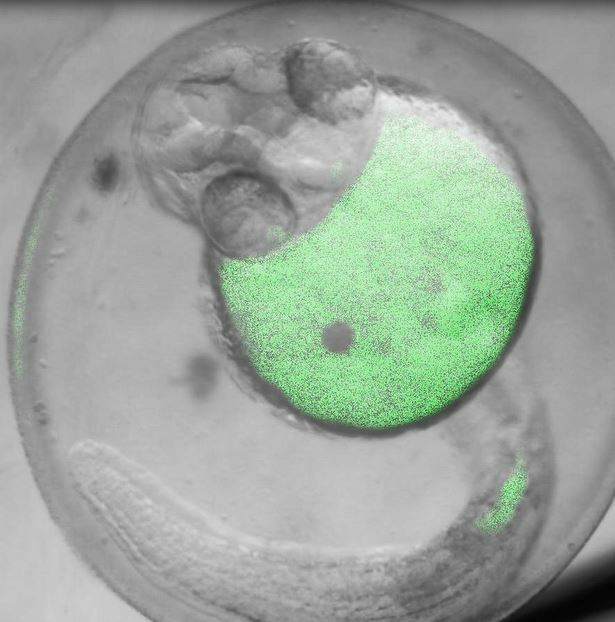 Neurogenetic studies require a wide variety of experimental setups for in vivo research. 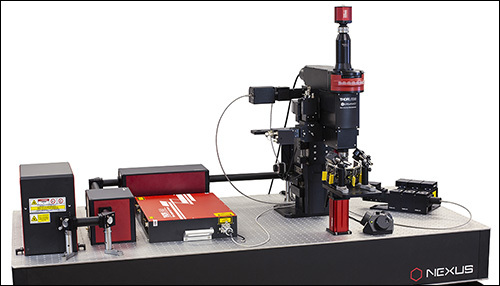 Multiphoton imaging is ideal for studying live organisms, especially embryos, as it reduces the occurrence of photobleaching and phototoxicity that is common with other light microscopy techniques. There are three multiphoton configurations we suggest for Neurogenetic applications (see the table below). 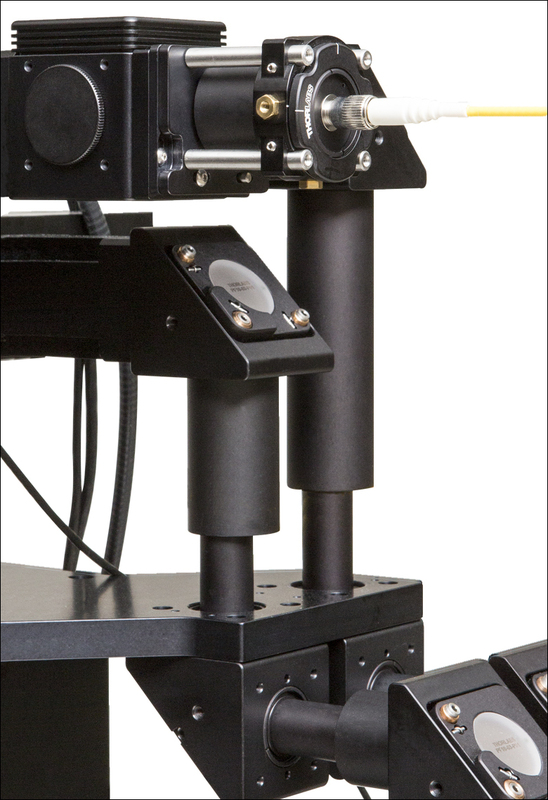 The small footprint and large throat depth of each system provide ample room for sample mounts and experimental apparatus, such as the large setup used for Drosophilia studies by Chen et al. (click here for supplementary videos). 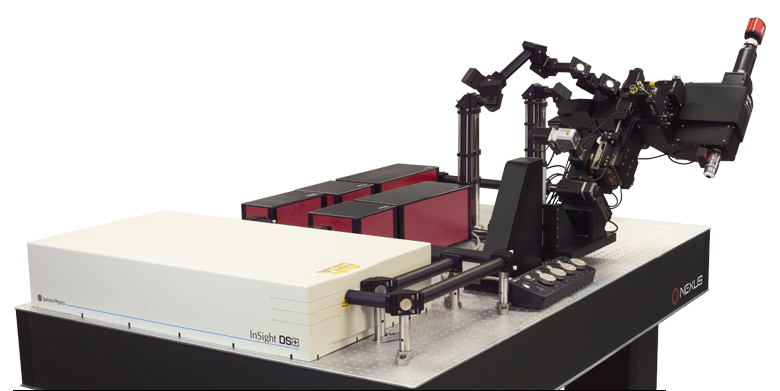 Additionally, these systems provide video-rate, sequential two-photon imaging to study fast dynamic biological and chemical processes in vivo without damaging the sample. 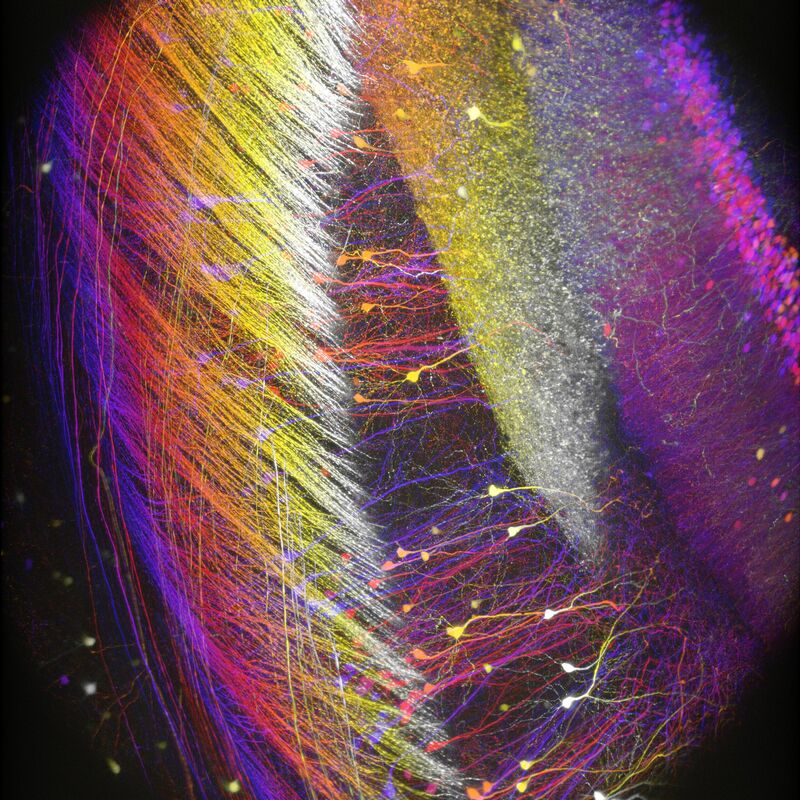 Chen CL, Hermans L, Viswanathan MC, Fortun D, Aymanns F, Unser M, Cammarato A, Dickinson MH, and Ramdya P. "Imaging neural activity in the ventral nerve cordof behaving adult Drosophila." Nature Communications. 2018 October 22; 9: 4390. Dechen K, Richards CD, Lye JC, Hwang JEC, and Burke R. "Compartmentalized zinc deficiency and toxicities caused by ZnT and Zip gene over expression result in specific phenotypes in Drosophila." 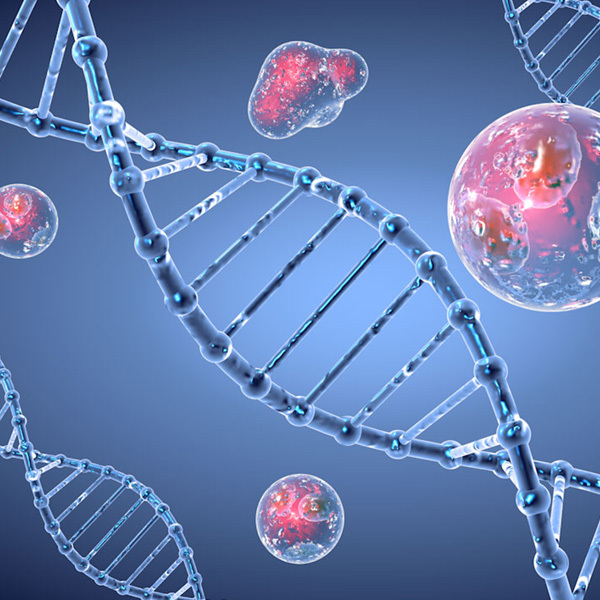 The International Journal of Biochemistry & Cell Biology. 2015 Jan 3; 60: 23-33. In vivo functional imaging of organisms and the individual neurons linked to specific organism behaviors requires high-speed and high-sensitivity imaging. We offer six configurations for this application (see the table below). 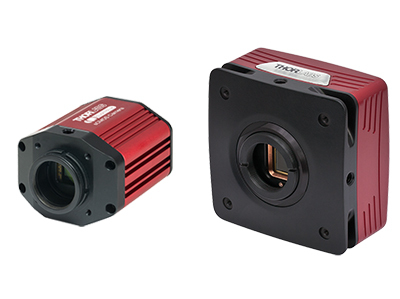 These configurations are equipped with an 8 or 12 kHz galvo-resonant imaging scanner and our 10° or 14° wide-angle collection optics to enable fast, high-resolution imaging. Each microscope system features a large throat depth, 5” of vertical travel, and smooth movement along the Z-axis to create a large working space ideal for in vivo volume imaging deep into highly scattering samples of neural tissue. 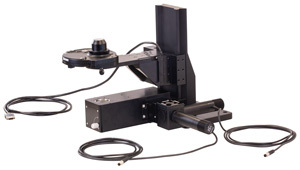 For an improved range of movement around a sample, we recommend a configuration with a rotating body. 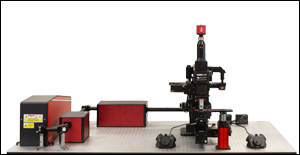 Aghayee S, Bowen Z, Winkowski DE, Harrington M, Kanold P, and Losert W. "Particle tracking facilitates real time motion compensation in 2D or 3D two-photon imaging of neuronal activity." Frontiers in Neural Circuits. 2017 Aug 15; 11: 56. Schnell B, Ros IG, and Dickinson MH. "A descending neuron correlated with the rapid steering maneuvers of flying Drosophila." Current Biology. 2017 Apr 6; 27 (8): 1200-1205. Roth MM, Dahmen JC, Muir DR, Imhof F, Martini FJ, and Hofer SB. "Thalamic nuclei convey diverse contextual information to layer 1 of visual cortex." Nature Neuroscience. 2015 Dec 21; 19: 299-307. Barnstedt O, Keating P, Weissenberger Y, King AJ, and Dahmen JC. "Functional microarchitecture of the mouse dorsal inferior colliculus revealed through in vivo two-photon calcium imaging." The Journal of Neuroscience. 2015 Aug 5; 35 (31): 10927-10939. Boyd AM, Kato HK, Komiyama T, and Isaacson JS. 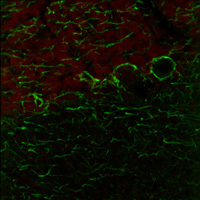 "Broadcasting of cortical activity to the olfactory bulb." Cell Reports. 2015 Feb 24; 10 (7): 1032-1039. By studying synapses and circuits, researchers are able to understand neuronal activity. 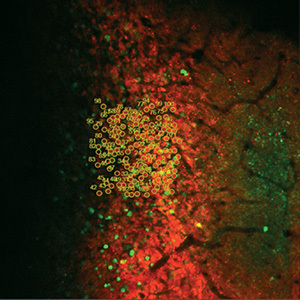 Imaging synapses and circuits often requires simultaneous stimulation of populations of neurons. 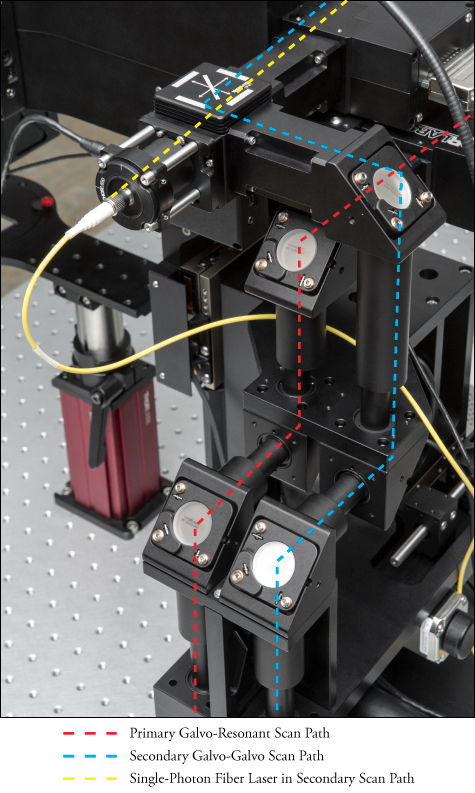 To achieve this, we offer three configurations of our multiphoton microscope capable of fast image acquisition of multiple regions within a single field of view (see table below). 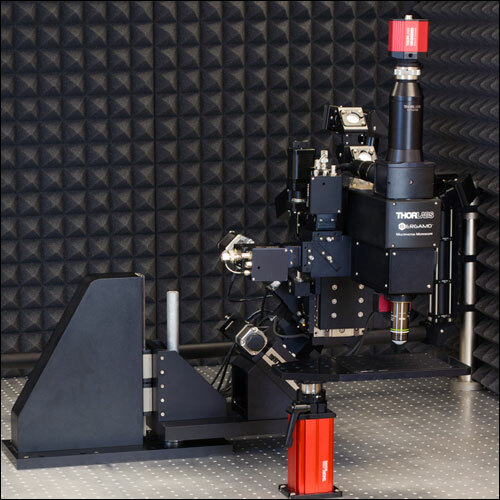 Our Multi-Target Photoactivation configuration features a spatial light modulator (SLM), which allows multiple sites in a sample to be photoexcited simultaneously. With the SLM, each beamlet can be shaped to improve the efficacy of photoactivation, a crucial feature for activating neural populations at varying depths within a single field of view (FOV). Our High-Speed, Random-Access Scanning configuration uses a resonant-galvo-galvo scanner to take multiple high-resolution images within a single field of view. 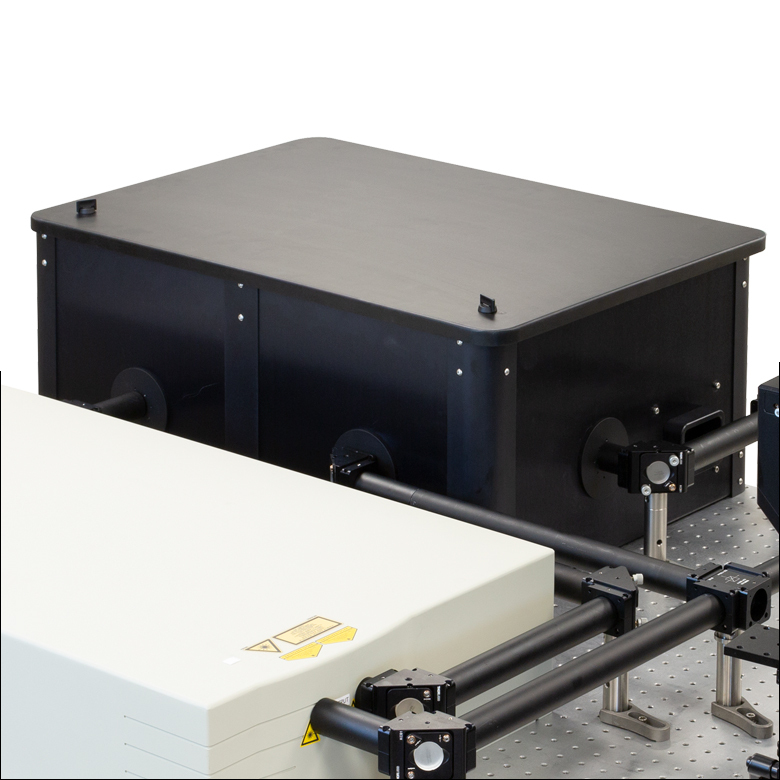 This scanner provides all the speed of a resonant-galvo scanner, while enabling multiple user-defined photoactivation regions. Lastly, our In Vivo Two-Photon Imaging configuration uses a galvo-resonant scanner for high-speed imaging. Scholl B, Wilson DE, and Fitzpatrick D. "Local order within global disorder: synaptic architecture of visual space." Neuron. 2017 Dec 6; 96 (5): 1127-1138. Leinweber M, Ward DR, Sobczak JM, Attinger A, and Keller GB. "A sensorimotor circuit in mouse cortex for visual flow predictions." Neuron. 2017 Sep 13; 95 (6): 1420-1432. Iacaruso, MF, Gasler IT, and Hofer SB. "Synaptic organization of visual space in primary visual cortex." Nature. 2017 Jul 27; 547: 449-452. Dipoppa M, Ranson A, Krumin M, Pachitariu M, Carandini M, and Harris KD. "Vision and locomotion shape the interactions between neuron types in mouse visual cortex." Neuron. 2016 May 2; 98 (3): 602-615. 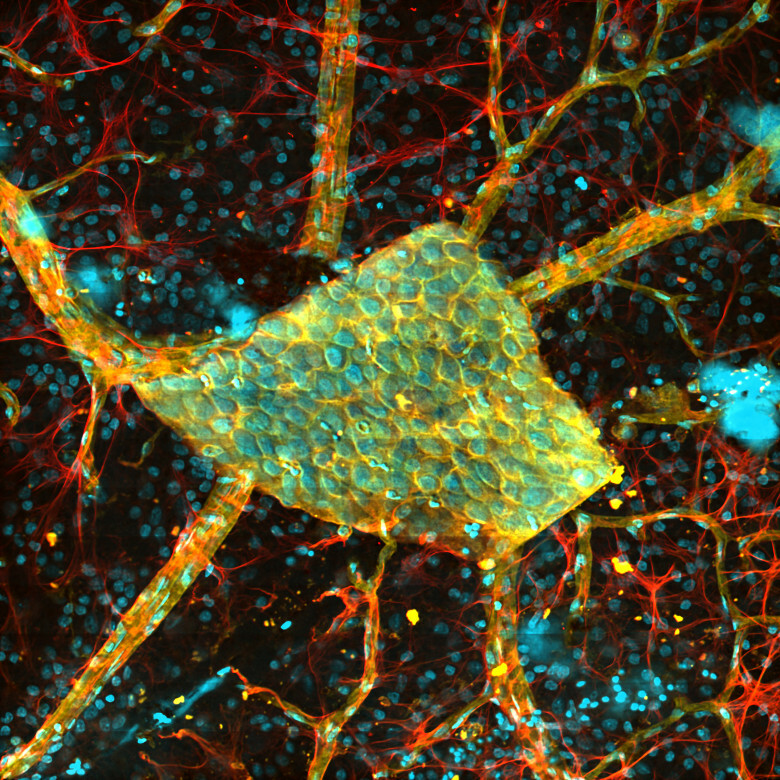 In this application, scientists are interested in neural connections and intercellular movement. 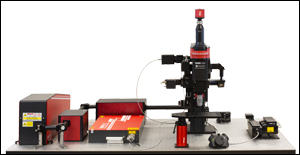 With multiphoton imaging, they are able to trace the direction and speed of ions moving through channel membrane proteins or neurotransmitters moving from one neuron to another. 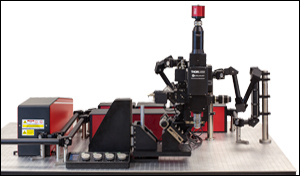 This research requires a microscopy system that has high-resolution and high-speed imaging of multiple fields of view (FOVs). 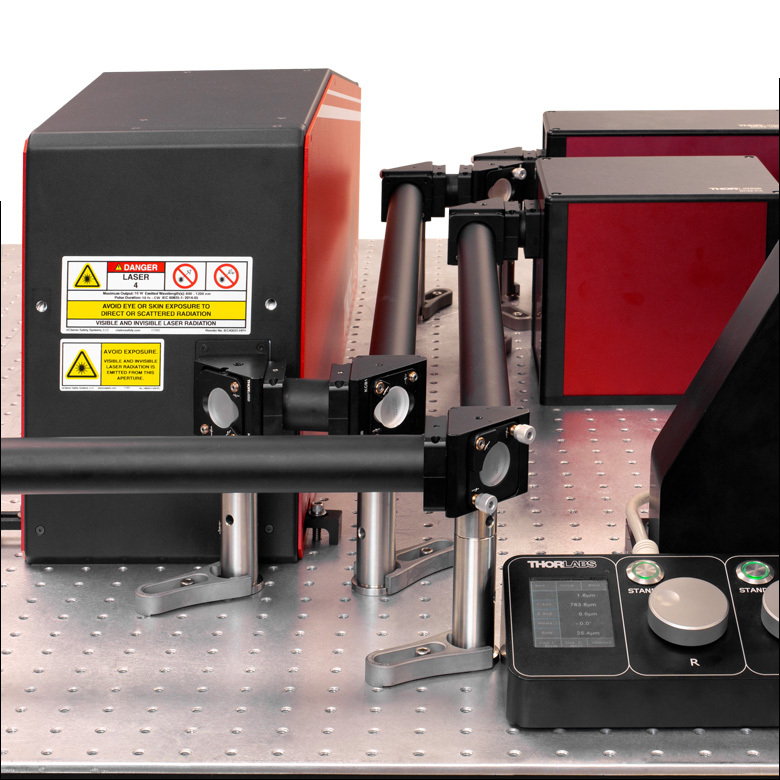 We recommend six of our multiphoton configurations for this application (see the table below). This area of research often requires both in vivo and in vitro imaging within the same study, so within each configuration, our transmitted light modules can be installed or removed by the user in just a few minutes, making it exceptionally easy to switch between the two imaging modalities. 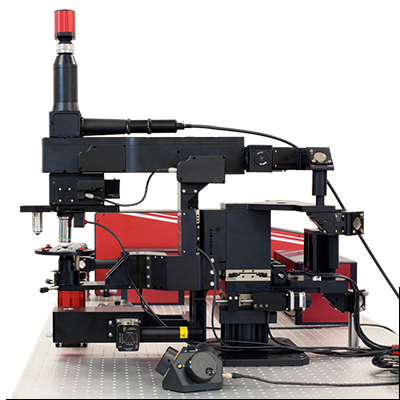 These configurations are capable of high-frame-rate imaging and targeted laser activation for photostimulation, making them ideal for correlating neural responses in multiple regions of the brain. De Toni L, Garolla A, Menegazzo M, Magagna S, Di Nisio A, Šabovic I, Rocca MS, Scattolini V, Filippi A, and Foresta C. "Heat sensing receptor TRPV1 is a mediator of thermotaxis in human spermatozoa." PLoS One. 2016 Dec 16; 11 (12): e0167622. Mongeon R, Venkatachalam V, and Yellen G. "Cytosolic NADH-NAD+ redox visualized in brain slices by two-photon fluorescence biosensor imaging." Antioxidants & Redox Signaling. 2016 Oct 1; 25 (10): 553-563. Lewin AE, Vicini S, Richardson J, Dretchen KL, Gillis RA, and Sahibzada N. "Optogenetic and pharmacological evidence that somatostatin-GABA neurons are important regulators of parasympathetic outflow to the stomach." The Journal of Physiology. 2016 Mar 9; 594 (10): 2661-2679. Cossell L, Iacaruso MF, Muir DR, Houlton R, Sader EN, Ko H, Hofer SB, and Mrsic-Flogel TD. 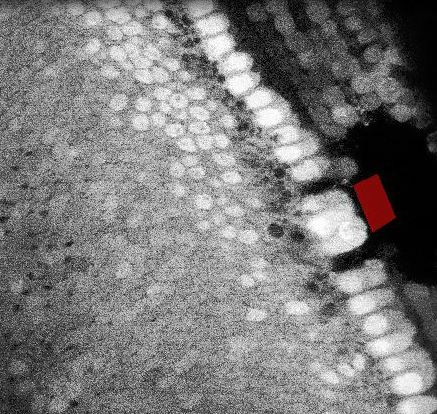 "Functional organization of excitatory synaptic strength in primary visual cortex." Nature. 2015 Feb 19; 518: 399-403. 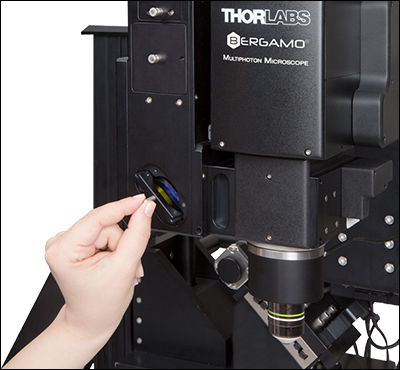 The study of cell biology, muscles, and glia often involves imaging in vitro or in vivo samples tagged with multiple fluorophores. 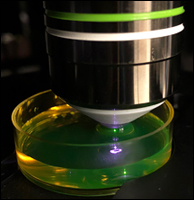 Through multiphoton imaging with these fluorescent markers, researchers are able to observe gene expression related to neural function in different areas of the brain. We recommend two of our configurations for this application, see the table below. With two to four channel detection modules and fast sequential imaging using our Tiberius® Tunable fs laser, both of these configurations offer the flexibility necessary for experiments in this field. 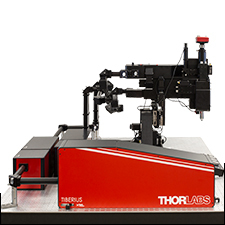 In addition, each configuration has a small footprint and a large throat depth to provide ample room for numerous sample mounting options, including in vivo imaging of mammalian brains via transcranial windows. Rose T, Jaepel J, Hübener M, and Bonhoeffer T. "Cell-specific restoration of stimulus preference after monocular deprivation in the visual cortex." Science. 2016 Jun 10; 352 (6291): 1319-1322. Monai H, Ohkura M, Tanaka M, Oe Y, Konno A, Hirai H, Mikoshiba K, Itohara S, Nakai J, Iwai Y, and Hirase H. "Calcium imaging reveals glial involvement in transcranial direct current stimulation-induced plasticity in mouse brain." Nature Communications. 2016 March 22; 7: 11100. Lu W, Xie Z, Tang Y, Bai L, Yao Y, Fu C, and Ma G. "Photoluminescent mesoporous silicon nanoparticles with siccr2 improve the effects of mesenchymal stromal cell transplantation after acute myocardial infarction." Theranostics. 2015 Jun 25; 5 (10): 1068-1082. Qin X, Qiu C, and Zhao L. "Maslinic acid protects vascular smooth muscle cells from oxidative stress through Akt/Nrf2/HO-1 pathway." 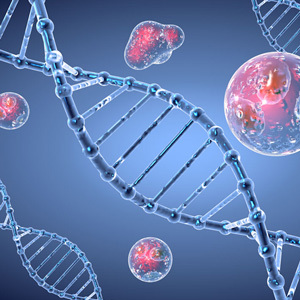 Molecular and Cellular Biochemistry. 2014 Feb 20; 390 (1-2): 61-67. 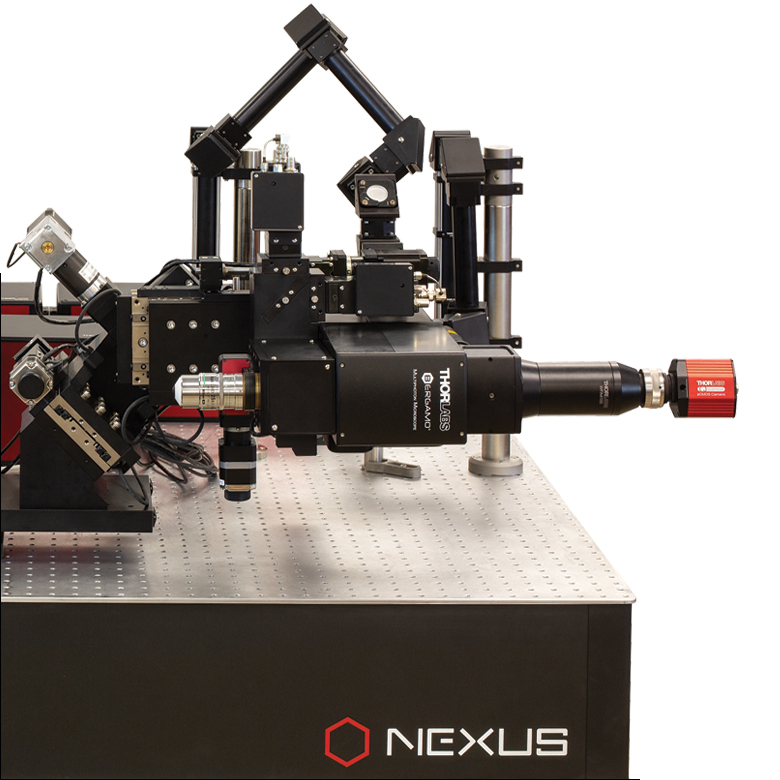 Drug discovery research is rapidly expanding and often requires a wide variety of experimental setups and imaging techniques. 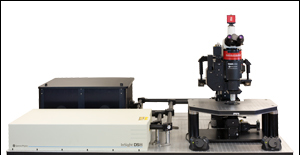 Two-photon imaging is frequently used to measure the characteristics of drug applications, including depth of drug penetration and the area of its spread throughout the cortex. We offer two configurations that are suitable for this application, see the table below. 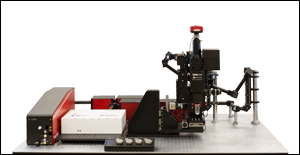 These configurations are are well-balanced for both in vitro and fixed stage in vivo microscopy research. 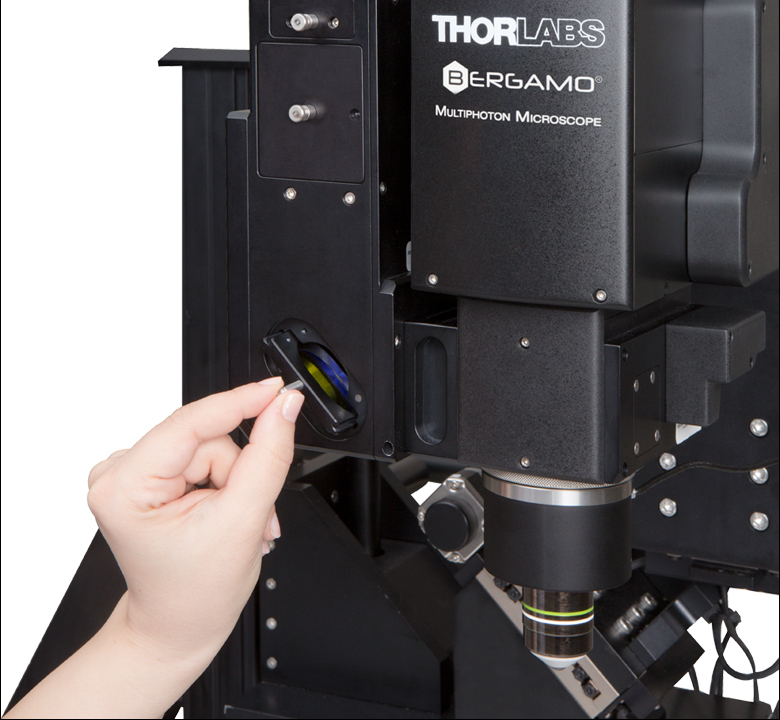 The modularity of the Bergamo systems' removable trans-illumination module provides versatility in regard to experimental techniques, imaging modalities, and sample subjects. 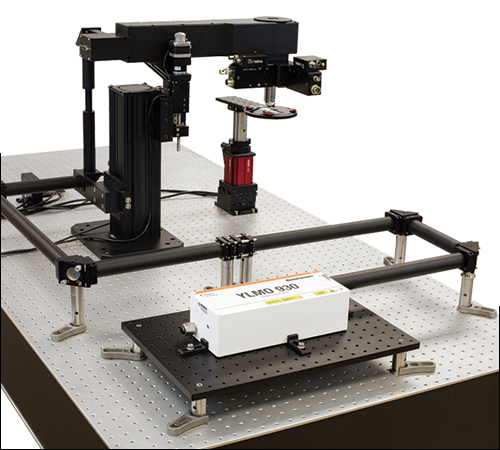 The Gibraltar breadboard platform line is ideal for mounting samples and supplementary equipment within these configurations. Strobl MJ, Freeman D, Patel J, Poulsen R, Wendler CC, Rivkees SA, and Coleman E. " Opposing effects of maternal hypo- and hyperthyroidism on the stability of thalamocortical synapses in the visual cortex of adult offspring." Cerebral Cortex. 2017 May 1; 27 (5): 3015-3027. Scattolini V, Luni C, Zambon A, Galvanin S, Gagliano O, Ciubotaru CD, Avogaro A, Mammano F, Elvassore N, and Fadini GP. "Simvastatin rapidly and reversibly inhibits insulin secretion in intact single-islet cultures." Diabetes Therapy. 2016 Nov 9; 7 (4): 679-693.
." Front. Neural Circuits. 2018 Jan 10; 11: 112. Klapoetke NC, Nern A, Peek MY, Rogers EM, Breads P, Rubin GM, Reiser MB, and Card GM. "Ultra-selective looming detection from radial motion opponency." Nature Neuroscience. 2017 Nov 09; 551: 237-241. Lu R, Sun W, Liang Y, Kerlin A, Bierfeld J, Seelig JD, Wilson DE, Scholl B, Mohar B, Tanimoto M, Koyama M, Fitzpatrick D, Orger MB, and Ji N. "Video-rate volumetric functional imaging of the brain at synaptic resolution." Nature Neuroscience. 2017 Feb 27; 20: 620-628. Scholl B, Wilson DE, and Fitzpatrick D. "Local order within global disorder: synaptic architecture of visual space." Neuron. 2017 Dec 6; 95 (5): 1127-1138. Kato HK, Asinof SK, and Isaacson JS. "Network-level control of frequency tuning in auditory cortex." Neuron. 2017 Jul 19; 95 (2): 412-423. 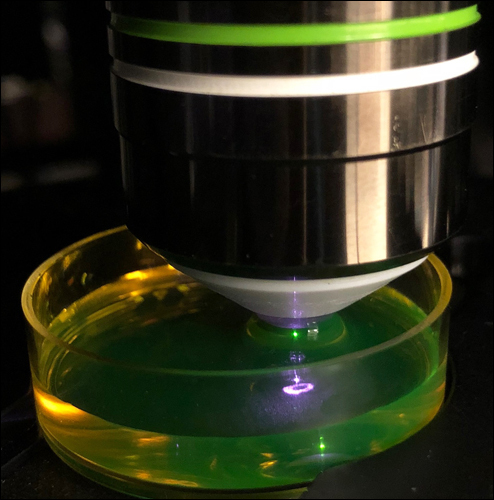 Mongeon R, Venkatachalam V, and Yellen G. "Cytosolic NADH-NAD+ Redox Visualized in Brain Slices by Two-Photon Fluorescence Lifetime Biosensor Imaging." Antioxid Redox Signal. 2016 Oct 1; 25 (10): 553-563. Pachitariu M, Stringer C, Schröder S, Dipoppa M, Rossi LF, Carandini M, and Harris KD. "Suite2p: beyond 10,000 neurons with standard two-photon microscopy." bioRxiv. 2016 Jun 30; 061507. Dipoppa M, Ranson A, Krumin M, Pachitariu M, Carandini M, and Harris KD. "Vision and locomotion shape the interactions between neuron types in mouse visual cortex." bioRxiv. 2016 Jun 11; 058396. Rose T, Jaepel J, Hübener M, and Bonhoeffer T. "Cell-specific restoration of stimulus preference after monocular deprivation in the visual cortex." Science. 2016 Jun 10; 352 (6291): 1319–22. Strobl MJ, Freeman D, Patel J, Poulsen R, Wendler CC, Rivkees SA, and Coleman JE. "Opposing Effects of Maternal Hypo- and Hyperthyroidism on the Stability of Thalamocortical Synapses in the Visual Cortex of Adult Offspring." Cereb Cortex. 2016 May 26; pii: bhw096 (epub ahead of print). Lee KS, Huang X, and Fitzpatrick D. "Topology of ON and OFF inputs in visual cortex enables an invariant columnar architecture." Nature. 2016 May 5; 533 (7601): 90-4. Monai H, Ohkura M, Tanaka M, Oe Y, Konno A, Hirai H, Mikoshiba K, Itohara S, Nakai J, Iwai Y, and Hirase H. "Calcium imaginq reveals glial involvement in transcranial direct current stimulation-induced plasticity in mouse brain." Nat Comm. 2016 Mar 22; 7 (11100): 1-10. Ganmor E, Krumin M, Rossi LF, Carandini M, and Simoncelli EP. "Direct Estimation of Firing Rates from Calcium Imaging Data." arXiv. 2016 Jan 4; 1601.00364 (q-bio.NC): 1-34. Roth MM, Dahmen JC, Muir DR, Imhof F, Martini FJ, and Hofer SB. "Thalamic nuclei convey diverse contextual information to layer 1 of visual cortex." Nat Neurosci. 2015 Dec 21; 19 (2): 299-307. Barnstedt O, Keating P, Weissenberger Y, King AJ, and Dahmen JC. "Functional Microarchitecture of the Mouse Dorsal Inferior Colliculus Revealed through In Vivo Two-Photon Calcium Imaging." J Neurosci. 2015 Aug 5; 35 (31): 10927-39. Chen SX, Kim AN, Peters AJ, and Komiyama T. "Subtype-specific plasticity of inhibitory circuits in motor cortex during motor learning." Nat Neurosci. 2015 Jun 22; 18: 1109-15. Jia Y, Zhang S, Miao L, Wang J, Jin Z, Gu B, Duan Z, Zhao Z, Ma S, Zhang W, and Li Z. "Activation of platelet protease-activated receptor-1 induces epithelial-mesenchymal transition and chemotaxis of colon cancer cell line SW620." Oncol Rep. 2015 Jun; 33 (6): 2681-8. Lu W, Tang Y, Zhang Z, Zhang X, Yao Y, Fu C, Wang X, and Ma G. "Inhibiting the mobilization of Ly6Chigh monocytes after acute myocardial infarction enhances the efficiency of mesenchymal stromal cell transplantation and curbs myocardial remodeling." Am J Transl Res. 2015 Mar 15; 7 (3): 587-97. Boyd AM, Kato HK, Komiyama T, and Isaacson JS. "Broadcasting of cortical activity to the olfactory bulb." Cell Rep. 2015 Feb 24; 10 (7): 1032-9. Cossell L, Iacaruso MF, Muir DR, Houlton R, Sader EN, Ko H, Hofer SB, and Mrsic-Flogel TD. "Functional organization of excitatory synaptic strength in primary visual cortex." Nature. 2015 Feb 19; 518 (7539): 399-403. Partridge JG, Lewin AE, Yasko JR, and Vicini S. "Contrasting actions of group I metabotropic glutamate receptors in distinct mouse striatal neurones." J Physiol. 2014 Jul 1; 592 (Pt 13): 2721-33. Peters AJ, Chen SX, Komiyama T. "Emergence of reproducible spatiotemporal activity during motor learning." Nature. 2014 Jun 12; 510 (7504): 263-7. Ehmke T, Nitzsche TH, Knebl A, and Heisterkamp A. "Molecular orientation sensitive second harmonic microscopy by radially and azimuthally polarized light." Biomed Opt Express. 2014 Jun 12; 5 (7): 2231-46. Liu J, Wu N, Ma L, Liu M, Liu G, Zhang Y, and Lin X. "Oleanolic acid suppresses aerobic glycolysis in cancer cells by switching pyruvate kinase type M isoforms." PLoS One. 2014 Mar 13; 9 (3): e91606. Palmer LM, Shai AS, Reeve JE, Anderson HL, Paulsen O, and Larkum ME. 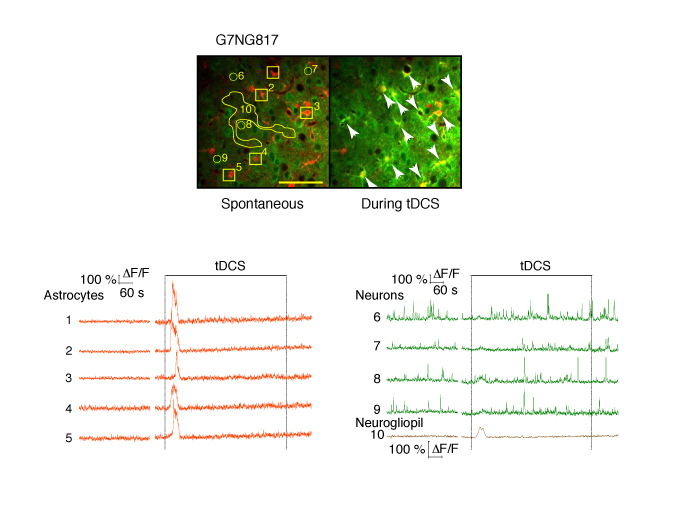 "NMDA spikes enhance action potential generation during sensory input." Nat Neurosci. 2014 Feb 2; 17 (3): 383-90. Cai F, Yu J, Qian J, Wang Y, Chen Z, Huang J, Ye Z, and He, S. "Use of tunable second-harmonic signal from KNbO3 nanoneedles to find optimal wavelength for deep-tissue imaging." Laser & Photon Rev. 2014; 8: 865-874. 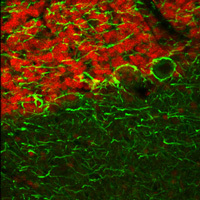 Kato HK, Gillet SN, Peters AJ, Isaacson JS, and Komiyama T. "Parvalbumin-expressing interneurons linearly control olfactory bulb output." Neuron. 2013 Dec 4; 80 (5): 1218-31. Takata N, Nagai T, Ozawa K, Oe Y, Mikoshiba K, and Hirase H. "Cerebral blood flow modulation by Basal forebrain or whisker stimulation can occur independently of large cytosolic Ca2+ signaling in astrocytes." PLoS One. 2013 Jun 13; 8 (6): e66525. Added Focus Tilt adjustment for Tile Capture; Allows User to Configure 3 Point Focus Plane to Be Used during Capture and Ensures Focus Across All Tiles. Application Fault Switching to Capture Tab if Bleaching Power is Non-Whole Number. I am looking for a cheap way to do confocal imaging in vivo. 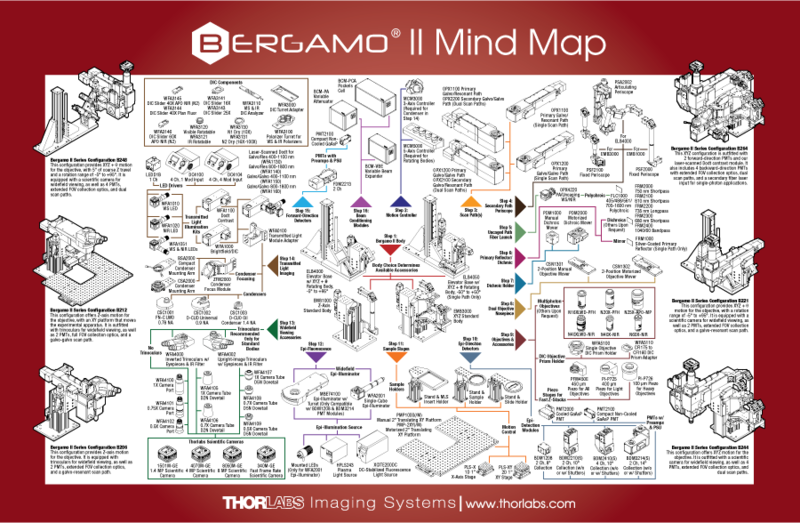 Is this Bergamo II Series Multiphoton Microscope my best option? Can you send me a quote? Hello, thank you for contacting Thorlabs. A member of our Imaging Team will reach out to you directly to discuss this system and your application. Hello, thank you for contacting Thorlabs. I have forwarded this request to our Imaging Sales Team. I apologize for the delay.